Then from the catacombs and dark caverns of medieval Europe you plunge into modern suburbia and the frolicsome adventures of a nubile lady jogger tracked by a savage werewolf. Finally, sensuality becomes macabre black comedy on the trail of three escaped mental patients who share a country house with a daffy murderess. Part of what I love about the Horror genre is its versatility, you can do almost anything with the genre and it can still work. Beyond straight traditional horror films, you've got all the great sub-genres like Horror-Comedies like 'Return of the Living Dead,' or Horror-Dramas like 'The Silence of the Lambs.' There are even Horror-Westerns like 'Bone Tomahawk' that play to both genre tropes and create something unique and frightening for the audience. For me, one of the more interesting sub-genres is the Horror-Anthology; the multi-story film held together by a unique theme. Classic examples like 'Tales From the Crypt,' 'Tales From the Darkside,' and even the terrific 'Black Sabbath' or the more modern 'Trick 'r Treat' are amazing films that offer up multiple short stories that can chill you to the bone. While there are some great entries in the Horror-Anthology arena, unfortunately, there are a few missteps. Jeffrey Delman's 'Deadtime Stories' from 1986 stumbles as much as it succeeds but still proves to be an entertaining watch. Poor little Brian (Brian DePersia) can't get to sleep. Terrified of the monsters in his closet or the ones living under his bed, he's too frightened to close his eyes. It falls on his babysitting uncle Mike (Michael Mesmer) to tell the tiny tot a story or two to get him to sleep. Rather than telling the child about traditional fairy tales, Mike's got his own spin on a trio of classic tales about a boy named Peter (Scott Valentine) and some witches, Red Riding Hood (Nicole Picard) and a werewolf named Willie (Matt Mitler), and a young girl named Goldi Lox (Cathryn de Prume) who joins the criminal Baer family headed by the devilishly lethal MaMa (Melissa Leo). Needless to say, Brian isn't going to be getting much sleep thanks to dear Uncle Mike! 'Deadtime Stories' is one of those efforts where I feel like its heart is in the right place, but the execution could have benefitted from some extra thought and time. The ideas for each of these stories is there, from the boy forced to work for witches to a girl avoiding a werewolf to the clever spin on Goldilocks and the Three Bears. Where things run aground for the film is with balance. It's not content with being just a straight horror film, but it also feels the need to inject some comedy into the mix. That in of itself isn't so bad; there are plenty of great Horror-Comedies out there. The problem is that this film tries to be too funny. The humor at times plays so over the top that whatever scares were once there quickly fade away. Which is a shame because there is some great material here. In particular, I loved the spin on Goldi Lox and the three Baers. I enjoyed the idea that the Baers are a trio of escaped convicts and Goldi Lox is actually a psychotic murderer with telekinetic powers. It's a great idea, however, the short's insistence to be funny with some really lame jokes stalls out any goodwill it worked to build. 'Deadtime Stories' was another one of those trips down memory lane for me. As I've mentioned in other reviews, this was one of those 80s horror films that I got to watch as a little kid because it was shown on T.V. albeit edited for content. I remember as a kid enjoying this one, but nearly thirty years later it doesn't hold up as well as I would have liked. I like the ideas behind a lot of the short films, the witches determined to resurrect their dead sister is a creepy idea. Any new take on werewolves is fun - especially when cast inside of the classic Red Riding Hood story, and I appreciate the Texas Chain Saw Massacre sort of spin on the Three Bears. That said, the goofball humor is so out of sync that nothing really blends well. Some great ideas are obviously present on screen, but I sadly found this flick a bit of a slog in places. Thankfully there are some impressive gore effects that are worth appreciating. I know this one has its core base of fans, but I sadly don't count myself among them. It has moments where things work well, but the tonal shifts aren't cohesive and can make the film a bit messy at times. As far as Horror-Anthologies go, it's certainly not the worst one out there, there are many others that completely fail at everything they try. 'Deadtime Stories' may not be a complete winner, but it does enough right to make it worth a watch. Don't take my less than enthusiastic points to heart. A lot of that comes from the fog of nostalgia being lifted. Newcomers may well enjoy the camp quality to it and again, the gore effects are certainly worth examining. 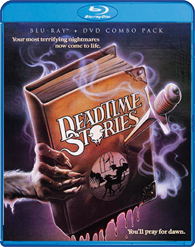 'Deadtime Stories' arrives on Blu-ray in a two-disc Blu-ray and DVD set from Scream Factory. 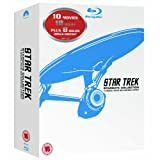 Pressed onto a Region A BD-50 disc, the Blu-ray and the DVD are housed in a standard sturdy Blu-ray case. The disc loads directly to a static image main menu with traditional navigation options. When analyzing the 1.85:1 1080p transfer provided for 'Deadtime Stories,' one must appreciate the fact that this film was shot over a couple of years as funds became available. Each short has it's own look and some bits of wear and tear. That said, the overall presentation looks fantastic. Film grain is present from the first frame, there is an appreciable amount of small feature detail from clothing to costuming to the impressive makeup and effects work. Colors are a bit of a tough one to lump together due to how the film was made. In the opening short with the witches, I found colors to be a bit on the red side with flesh tones a tad too pink. During the Red Riding Hood short, reds are pulled back a bit too much so that a bright primary red jogging suit looks a bit pink and flesh tones a bit pale. Ironically enough, Goldi Lox and the Three Baers looks just right. In all three shorts primaries have a strong presence albeit to varying degrees. Black levels are rich and inky without any crush issues to contend with. There does appear to have been some slight edge enhancement applied here and there, some scenes just look a bit too crunchy in places with rough edges. The print sourced for this transfer is in pretty terrific shape, the only damage to report appears during the third story where it looks like the negative had split at some point. All around, this is a pretty great looking transfer for a film of this vintage. 'Deadtime Stories' arrives with a solid English DTS-HD MA 2.0 mix that does a pretty terrific job of handling the workload assigned to it. Dialogue is clean and clear throughout. The score and title song have a nice presence to them and help balance out the presentation. Sound effects can be a bit heavy in places, especially when their goal is to be more comedic, but there is plenty of natural background atmospherics to give a sense of space and dimension. Levels are solid for this mix so once you've got your volume at a comfortable level, you should be all good to go. Free of any age-related issues, hiss, or breaks, this is a solid audio mix that suits the flick well. Audio Commentary: Director and Co-Writer Jeffrey Delman delivers a pretty great solo commentary track. From the get go the man is full of trivia and tidbits that fans of the film will eat up. It's especially great when he goes into detail about the gore effects and how they were achieved. A Band of Gypsies: The Making of 'Deadtime Stories': (HD 15:35) Goldi Lox actress Cathryn DePrume, Mama Baer actress Melissa Leo, and actor Scott Valentine offer up some pretty terrific stories about working on the film, getting the part, and working on some of their earliest roles. Jeffrey Delman Interview: (HD 15:42) Delman offers up a more simplified version of what he detailed in his commentary track, but it's still a pretty terrific interview. Original Black Forest Short Film: (SD 29:49) This is the original version of Peter and the witches story that was later reshot for the film. This version was at one time intended to be a feature-length version or something close to it. This is from a tape master and is in fairly decent shape. It's interesting to see where this original version aimed to go with the story and it could have been made longer into a full feature, but it's plot structure as written really works better in the shortened version scene in the film. Red Riding Hood Alternate Opening: (SD 2:32) This is the original opening of the short before the producers wanted a more racy opening. This return to 'Deadtime Stories' after nearly thirty years may not have been the trip I'd hoped it would be, but I'd be lying if I said I didn't have some fun with it. Diehard fans of this Horror-Anthology will have a great time with this release from Scream Factory. With a fresh new transfer and some decent bonus features, there's a lot to appreciate about this release. 'Deadtime Stories' may not be the greatest entry in the sub-genre but it's certainly worth a look if you've never seen it. If you like your horror goofy and playful, this should be your kind of show. Worth a look.